Today’s the day for more PROGRESS!! I told you friends last week I wanted to start sharing and celebrating design project progress with you more often on here, so here we go again! This apartment is in NYC right by Prospect Park. I can’t tell you how much I adore these clients, (and their sweet pup, who you’ll see with her friend in some of the pics)! When they gave me the initial walk through via video chat, it was love at first sight. Those arches, those windows, that molding, the floor! It’s different architecture than I’ve ever had the privilege of designing within before, so I was excited about that from the get-go. Take a look at these ‘befores’, (all photos in this post were taken by the client)! This is actually a 4-room project: Entryway, Living Room/Dining Room, Office and Master Bedroom. This fun couple has traveled quite a bit and accumulated a collection of artifacts and pieces from around the globe. They expressed interest in doing some unique things in their home which I was really excited about! It’s always fun to work with others who have a vision and enjoy wandering off the beaten path a bit, stylistically. The trim was one of the first elements we discussed as an opportunity to do something a little different! I chose Swiss Coffee for the walls, (a StyleMutt Home favorite), and Clay Beige for the trim, (both by Benjamin Moore). I am going to wait to detail out here the pieces we’ve selected, but it’s getting there! Now the space is ready for the next phase of it’s makeover - built-ins! I’ve been in touch with their contractor working on a built-in shelving design that will work with the structure of these walls. The TV will sit in the middle of the shelves and we’ll have hidden storage cabinets under the shelves…I absolutely cannot wait, it’s going to look SO GOOD! 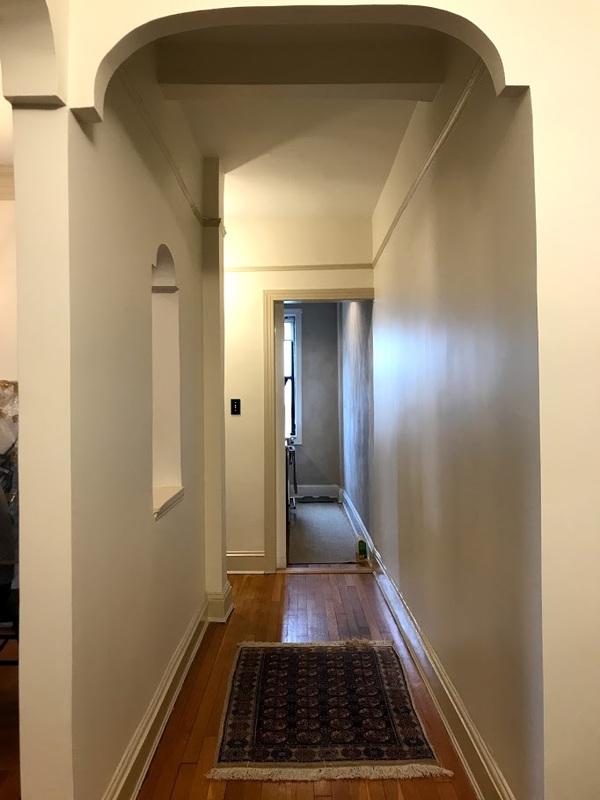 The hallway was papered by the previous owners, and while the idea was splendid, the paper was not making any particular statement, (it was white and had a grayish swirl pattern on it). We loved the idea of something really bold that you’d see beyond the living and dining area, and this navy geometric does not disappoint. In a home that does not have an open floor plan whatsoever, one way to expand the size of any room is to draw the eye beyond the walls of the space. The images below are a perfect example of this! We are working on selecting art, various rugs for the hallway and office, final details for the bedroom, and then we’ll have some shelves to style! We are using a very large triptych the client found from a street vendor in India over the sofa - oh my gosh, it’s going to be amazing. Here is the rendering we used to show them the vision - cool piece, huh! 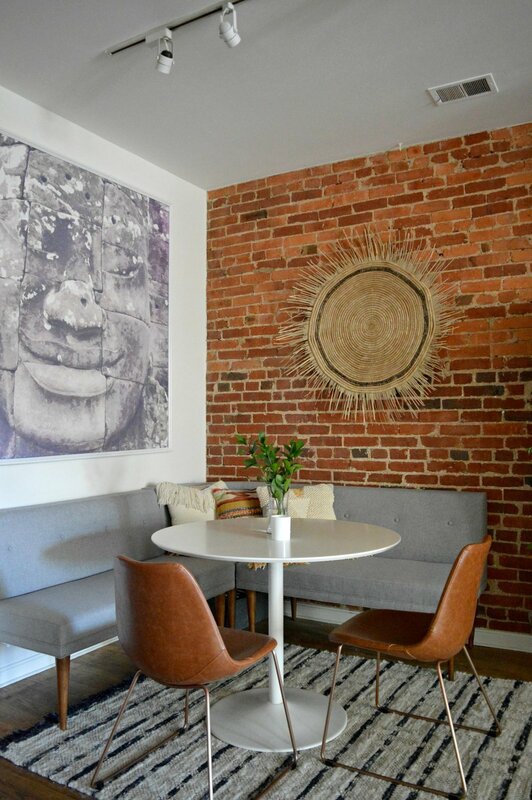 It reminds me a bit of when we used Ali’s Cambodian photograph over her own living room sofa, and then when she moved, over her dining nook banquette! I just adore large-scale pieces - especially when they have deep meaning to the client! So we still have a ways to go, but this is some progress, isn’t it! The paint on the walls and trim is making me so ridiculously excited. I’ve never done white walls with beige trim before, and truth be told, there wasn’t a ton of inspo I could find as an example, But it just felt so right for this home and now seeing these progress shots they sent is giving me so much encouraging confirmation. I’m in love! It’s sophisticated and subtly dramatic - the perfect canvas for a home to a couple of globe trotters. We are in cahoots over here on the finishing details for this beautiful home, and I am busting to share everything with you here and now….but I’ll refrain. Gotta save some surprises! Just wanted to share this exciting project in the works now because it’s making me too giddy to keep to myself any longer! I can’t wait to visit NYC soon to hug these fabulous clients and take all the fun pictures to share the final reveal with you! It’s going to be a good one, friends. As always, I’m so grateful to you for coming by today! Hi Friends! It’s been a little while! I realized when catching up with some friends I hadn’t seen in a while that I’ve neglected sharing StyleMutt Home design work on here in a big way! I have to be honest, if I don’t have a final reveal to share with you guys, I don’t really know what to share. The truth is I am up to my ears in design projects but have very little hope of seeing many, if any, of the jobs completed. For one thing, many clients are not local. This presents the hurdle of coordinating travel, (and paying for it), to go take pictures of any projects that are actually completed according to the design plan. The design plan is another hurdle! Even when I deliver a design within the clients budget, with all the tools to make purchasing the items a cinch and an annotated floorplan indicating where every single item goes, many jobs don’t get completed exactly according to the vision. And as a homeowner I TOTALLY get it. Financial ‘surprises’ come up and sometimes the budget you had for fun stuff, (think art, pillows, a pretty rug or lamp), goes to not-so-fun stuff. This is the number one reason why more jobs don’t ever make it on here, and even though I absolutely understand it as a homeowner myself, it’s a tough reality to face. This is, indeed, a creative job. It’s a profession that attracts creative personalities! Creativity has always been a part of my life in a very tangible way, and my favorite part of the creative process has been seeing a vision come to life. It just so happens that in this particular creative field of work, I very rarely see the vision come to life. I’m working on some ideas to improve the process, but I have had to really come to terms with that and press forward with my best effort. While this has been an unexpected challenge, I am so incredibly grateful that I have the opportunity to work and make some income on such a flexible schedule. I feel like I am able to be ‘all in’ with my kids and be available and present in their lives, and I am able to work around our family time. What a gift!!! So, despite some unexpected challenges with the job, it is still a dream come true. And despite not getting to share as many finished projects with you as I would love, I’d like to make a better effort of sharing and celebrating project progress! I absolutely love putting design concepts together for our clients and since that’s what I am doing every week, I figured why not share them with you! So here we go; A quick breeze through of some recent design concepts that I’ve completed since New Years! 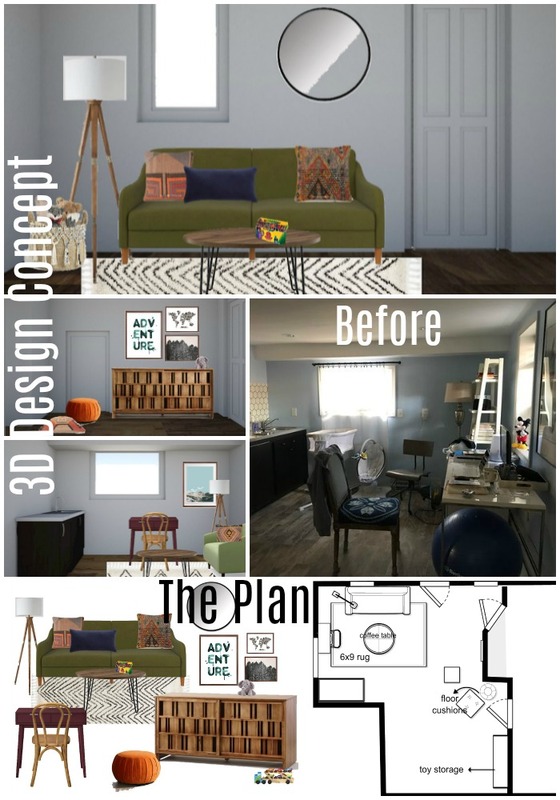 For each project I create a design board that is more or less a ‘collage’ of the pieces that will fill the room, a floorplan that maps out where all the items will go, and a 3D rendering of the design as it would look in their own space. In addition to these, I also provide a complete shopping list that our clients can use to conveniently purchase through the pieces in the design. A single design project can take from two weeks to a year, depending on the scope of the job! Project goal: Transform the over crowded space with more comfortable pieces that will enable this basement to function as a lounge area, colorful play room, and small workspace. 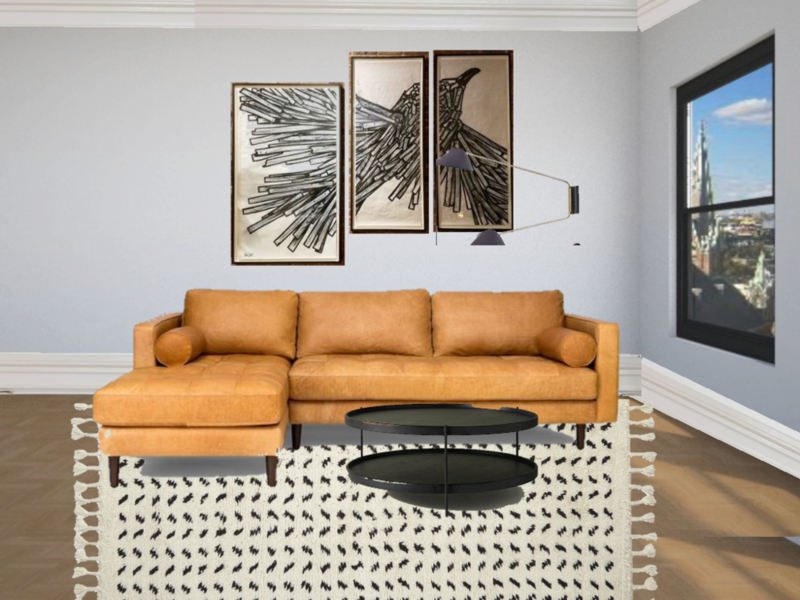 Project Goal: Use client’s existing sofa, rug and art to create a comfortable living room with surrounding pieces that still allow flow in this very narrow room. 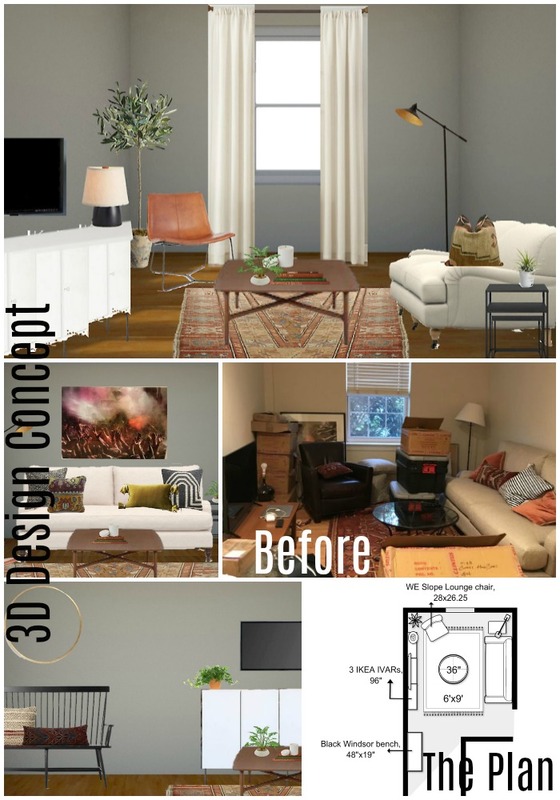 Project Goal: Create a modern, yet cozy formal living room suitable for entertaining. Project Goal: Work with the existing kitchen to blend the space in with the rest of the home - modern yet casual pieces that are warm and inviting. 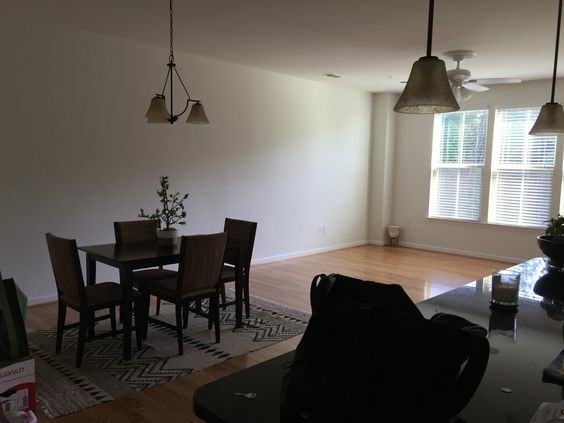 Project Goal: Create a very minimal yet warm formal dining space. Client needs space for their piano and favorite pieces of art. Project Goal: Transform this sunroom into a relaxed but chic office and lounge space. 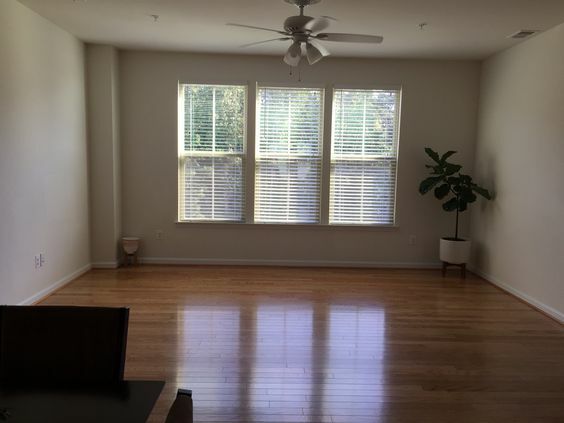 Specific request for asian inspired art, shelves for books, and a chaise lounge to read. I have had such a blast with these projects over the past two months! In addition to starting these since we rang in the New Year, I also now have 4 additional projects that are on track to be completed this Spring. I’m feeling hopeful, guys! Fingers crossed there will be some really fun fresh design projects to share here soon! I do have a little refresh I worked on in our basement ready to share, so stay tuned! Hello, sweet friends! This is a special reveal and one that’s been close to my heart for quite some time. Last April during my kids’ Spring Break I read through Chip Gaines’ book, Capital Gaines. It’s an all-around motivating, get-it-done read, but the thing that stuck with me the most was the encouragement to bet on yourself. And it got me thinking that one person betting on their own selves can’t possibly have the same power as people betting on one another. I started mulling over the idea of looking for a design job to do for peanuts for someone in need. I wanted to give someone that oomph to keep on keeping on, even if just through the simple act of improving the way they feel at home. One month later in May, we were contacted by an amazing woman who was at a point of reinvesting in her life. Gods timing astounds me. I think most all of us can attest that life doesn’t always, (or usually! ), go as expected, and this woman had just been pitched a curve ball. With two young children in toe she was starting fresh with a new home, an old sofa, and a very happy fiddle leaf fig tree. The thing that just overwhelmed me with emotion while speaking with her was the fact that she wanted to make the most of this next chapter. It was apparent that there hadn’t been joy in her home for quite some time, and that’s what she wanted to bring back. ‘Happy’ was a frequent word that came up when discussing the vision and design of her home. The first order of business was rotating that sofa and pushing it against the wall! This family room space is shared with the children in a big way, and the original placement of the sectional floating in the middle of the floor just made it too chopped up and separated. Also, PSA: With $40 and an 8 minute YouTube video, you, too, can update your overhead lighting. So. Much. Beige. With an emphasis on creating an environment that feels happy, color was top priority. The catch, however, was that because this is a rental, the wall color and carpet could not be updated. And because the client requested to use her sofa, (a smart move that allowed her to put her budget in SO MANY other places), that was another shade of beige to overcome. Picking pillows and accent pieces for this space was an absolute blast. With a bland canvas to work with the sky really was the limit, so I had to uncover what palette spoke to my client best. She is extremely inspired and rejuvenated by the coast, but I didn’t want to do anything too literal. Creating a relaxing vibe with pops of vibrant color was the way to go. Blue is a favorite color of hers so I peppered it around subtly. Ah, yes - the wall mounted Ikea IVAR cabinets. This is the third design since last Spring that we used wall mounted IKEA cabinets to create a custom, clean-lined storage option, (see here and here). You can always add hardware, legs, etc to these to blend them into your own space, but my favorite way to use them is to mount them over the floor 6-8” and give them a fresh coat of paint, (they come in wood). And at just $80 per set of cabinets, that means this massive custom media storage unit cost just $240 + cheap paint. There wasn’t much to do in the kitchen but change out the pendants and add some stools - leather for the win! More beige! For the particular vision and feel this client wanted, I knew the dark matching dining set had to go. A new mix of pieces pieced together from various retailers creates a one-of-a-kind dining set for the family. The first item we decided on was that rug - even prettier in person if you can believe it! This cheery space feels special to me - the colors echo the rest of the home but there’s something about it that makes it feel set apart. It’s grown up but fun, simple but interesting, stunning but functional, (the cabinet is packed with board games)! I have never ever used a sofa in that color before but my gut was pulling for it and I was excited to fill in around it with some contrasting tones - even moodier rich and earth colors! I think the vibrancy of the sofa just adds some sophisticated drama here when surrounded by earthier tones and textures. Anchoring one whole side of the room by itself is one of my favorite go-tos; an oversized black framed mirror. Not right for every home, but right for this one in this place. It’s a beast in person, and emphasizes the drama of this room. Well that’s a wrap! The first thing this sweet client told me when I sent her a sample of these photos was that she can’t believe this is her home and can’t wait to start on her bedroom together in the new year. I can’t wait, either!!! You all have a wonderful Thanksgiving! It’s a treat every time I have an opportunity to jump on here and share something with you. You make this landing place so much fun and it brings me joy to get to bring finished projects here to show you. So thank you for taking the time out of your day to stop by - it really touches our hearts!